Clay Art Center is raising awareness about food insecurity and hunger in Westchester during our bi-annual Empty Bowls fundraiser. For the past 18 years Clay Art Center has mobilized hundreds of community members and artists to create thousands of handmade ceramic bowls in partnership with the Rye Presbyterian Church. 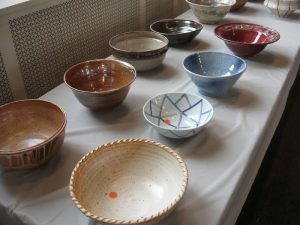 Join us at the Empty Bowls fundraiser held at Rye Presbyterian Church on January 28th, at 11am to purchase beautifully crafted bowls made by more than 50 Clay Art Center artists. Take home a unique bowl and enjoy warm and comforting soup & bread donated by Cornerstone Catering and Kneaded Bread, free with your purchase of a bowl. Together, with Rye Presbyterian Church and a host of volunteers, we have raised over $75,000 in the fight to end hunger in Westchester County.